Frozen is an emotionally compelling film by Disney aimed at a young teen audience. I believe it's success stems largely from the relationship between the two sisters, Princesses Anna and Elsa, which is both authentic and unprecedented. Elsa, the older sister, possesses magical ice powers which she cannot fully control, especially when she becomes afraid. Consequently, when the girls are quite young, Elsa accidentally injures Anna. For the rest of their childhood, Elsa isolates herself and tries to suppress her feelings and her power in order to fulfill the role expected of her when she becomes Queen. Her guilt and fear of her own power are easy to empathize with. The audience also feels empathy for Anna who grows up lonely and feeling rejected by her older sister. I have come across two other analyses of Frozen published online by experts in Dramatica theory. One of this is written by James R. Hull, the other was created by the Dramatica Users Group led by Chris Huntley (one of Dramatica's creators). Both these analyses disagree with each other on several points, and I disagree with them on many of the same points. One cannot eliminate the subjective aspect of story analyses. We all see stories differently and certain elements carry more weight for some people than others. It also seems clear that Frozen is not a perfect example of story structure, but the fact that it gets so much right certainly contributes to its dramatic impact. Note: The following will make more sense to users of the Dramatica software. We agree that Frozen has a happy or Comedy ending. The Story Goal is achieved and the main character is better off in the end. We agree that Anna is the main character and Elsa the impact character. We agree that Anna is a steadfast character. She never gives up her belief that Elsa is not dangerous, nor her conviction that they can be "best buddies" again. Anna is a "do-er" in that she tries to solve her problems through action (building a snowman, riding out after Elsa, climbing a mountain, etc.). She is clearly a linear thinker, focusing on one primary issue at a time rather than weighing multiple issues. She loves Elsa and falls head over heels with Hans (the first boy she meets). Because of her linear bias, she pays little attention to other aspects of their personalities, including warnings signs that suggest relationships with them may carry some risks. We also agree that Anna's throughline revolves around Activity, the natural home of a do-er. How I See the Story Goal of Frozen. Where I see things differently from the other analysts has to do, I think, with which story elements we choose to prioritize. For me, the most important element in any story is the Story Goal. I see this as the lynchpin around which the rest of the story organizes itself. Though they disagree on the Story Goal of Frozen, both the other analysts place the Overall throughline in the domain of Situation. The Overall story concerns the majority of characters and the story world as a whole. Certainly, the kingdom of Arendelle finds itself in the difficult situation of perpetual winter when Elsa unleashes her powers (again by accident) at her coronation ball. However, I disagree with this interpretation. While the winter is certainly inconvenient to certain characters (particularly Kristoff and Oaken whose businesses take a downturn), no one seems to suffer serious costs as a result of it. There is no clear consequence that will result if the winter remains in effect. Nor is there a protagonist character pursuing the end of this winter. Anna is more concerned with restoring her relationship with Elsa and supporting her sister than thawing the kingdom. As for Elsa, who I see as the real protagonist, her primary concern is learning to control her powers or at least to use them in a way that does not cause harm. Achieving this goal is essential so that Arendelle can have an effective Queen who can both end the winter and also protect the kingdom from the scheming nobles who want to exploit it (Hans and Wesleton). In Dramatica, the type of Story Goal that concerns the effort to control or train one's impulses is called Impulsive Responses, which falls under the domain of Fixed Attitude. This is the domain of main stories concerning prejudice, and certainly the people of Arendelle have a strong prejudice against sorcery. With this above assignment of the domains and concerns, I can now outline the dramatic structure of the story in terms of the progressive elements (drivers and signposts). 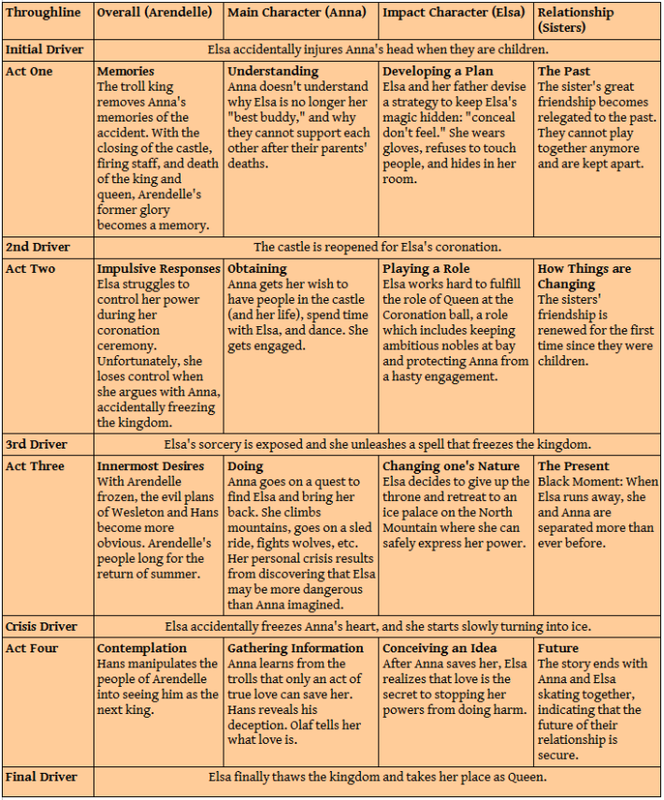 Please note that the following table is arranged to show how each throughline unfolds over the course of the story and where the act breaks occur. It does not reflect exactly the order of events within each act. Elsa must learn to control her powers so she can use them without causing harm. If Elsa fails to become a proper Queen, Arendelle will be vulnerable to greedy nobles such as Hans and Wesleton who want to exploit its riches for their personal gain. If she remains isolated, the country's economy will remain shut down or frozen (castle stays closed, ships can't move, business falters). Elsa must learn to use her power out of love rather than fear. She does this when she creates Olaf, when she builds her ice palace, and when she thaws the ice she put in Anna's heart. Every time Elsa is possessed by fear, she unleashes her powers in a way that causes harm. This is seen when she injures Anna, when she freezes the kingdom, and when she almost kills Wesleton's guards. Elsa gives up being a real sister to Anna, and later gives up being Queen, in order to keep herself isolated and protect people from her power. After running away, Elsa creates a beautiful ice palace where she can feel free to be herself. If Elsa has any hope of becoming Queen, she must not let herself become a monster. The father gives Elsa gloves and shutters the castle to isolate her until she can control her power. Elsa is the one primarily concerned with the Story Goal of controlling her impulses to unleash her power. Considering the danger her powers present is what causes her to isolate herself in the castle (as a girl) and on the North Mountain (after her coronation). She even considers that her death might be the best solution. Hans wants to take over the kingdom by marrying one of the sisters and then killing both of them. This will not happen if Elsa masters her power and fulfills her role as Queen. We know this because once Elsa masters her power she has Hans expelled along with Wesleton, who also wants to exploit Arendelle's riches. The Troll King offers help and makes an appeal to conscience when he warns the father how important is is that Elsa avoids fear. The temptation/hinder role seems to be best filled by the trolls who get in the way of Anna and Kristoff's efforts to find a cure for Anna's heart by dragging the couple into a wedding ceremony. Kristoff only goes on the journey because of the gifts Anna keeps giving/promising (carrots, a new sled, other winter gear). Otherwise he Opposes the plan. He also does a great job of being skeptical about Anna's decision to get engaged to Hans on the same day they met. 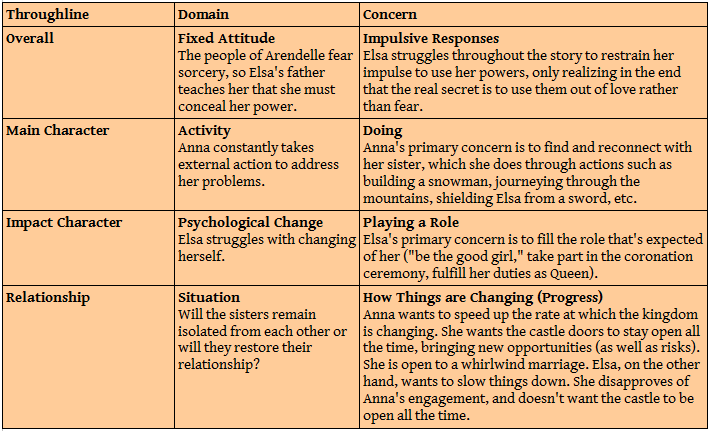 As well as being the main character in the subjective story, Anna embodies the Emotion role in the overall story. She is Uncontrolled externally (clumsy). Moreover, her decisions (to get engaged, find Elsa, save Elsa, etc) seem to be based entirely on Feelings. Though Sven the reindeer doesn't talk, Kristoff uses a ventriloquism trick to make Sven the voice of reason in the story. Sven's emotionless face is an example of external Control, a function of Reason characters. If you are interested in seeing how the other Dramatica experts see this film, you can read their analyses at the Dramatica site. * Based on Dramatica theory created by Melanie Anne Phillips and Chris Huntley.